Mary Haines (Norma Shearer) can't believe her husband's having an affair with salesgirl Crystal (Joan Crawford). 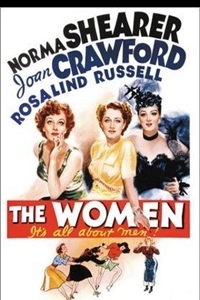 But when Sylvia (Rosalind Russell) and Edith (Phyllis Povah) deliver the gossip firsthand, Mary heads to Reno for a divorce. En route she meets Countess de Lave (Mary Boland) and Miriam (Paulette Goddard), who coincidentally is having an affair with Sylvia's husband. Once in Reno, the Countess finds another beau, Sylvia shows up for a divorce and Mary plots to win back her man.